There is no test to prove a distribution is non-normal stable. However there are tests that indicate stability. One of these is a test for infinite variance. For the normal (a special case of stable) distribution the variance converges to a finite real number as grows without bounds. When tails are heavy (stable ) variance does not exist or is infinite. Granger and Orr (1972) devised a running variance test for infinite variance that is displayed here. 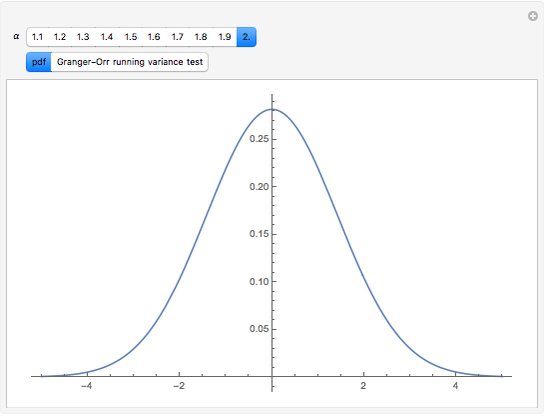 Note that when , the distribution is normal and the plot of the test shows the variance converging. At lower levels of the plot remains "wild" indicating infinite or nonexistent variance. 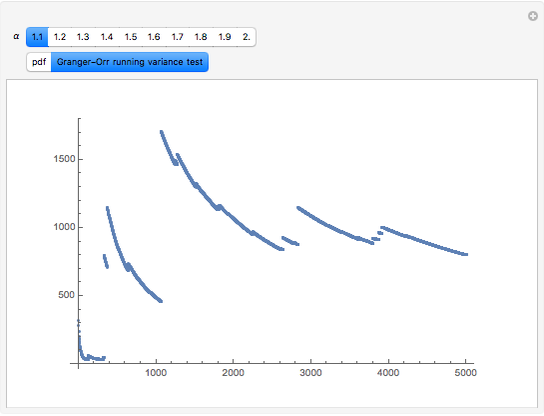 The method of generating random variables used here is Chambers et al. Other approaches, based on their work, have been developed. More information is available in chapter six of  and at mathestate.com. J. M. Chambers, C. L. Mallows, and B. W. Stuck, "A Method for Simulating Stable Random Variables," Journal of the American Statistical Association 71, 1976 pp. 1340–1344. C. W. J. Granger and D. Orr, "Infinite Variance and Research Strategy in Time Series Analysis," Journal of the American Statistical Association, 67(338), 1972 pp. 275-285. Roger J. 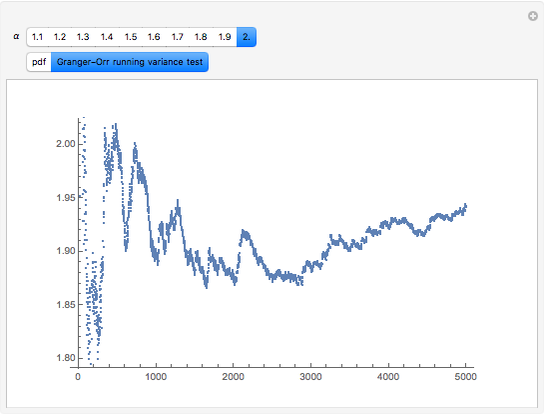 Brown "Granger-Orr Running Variance Test"